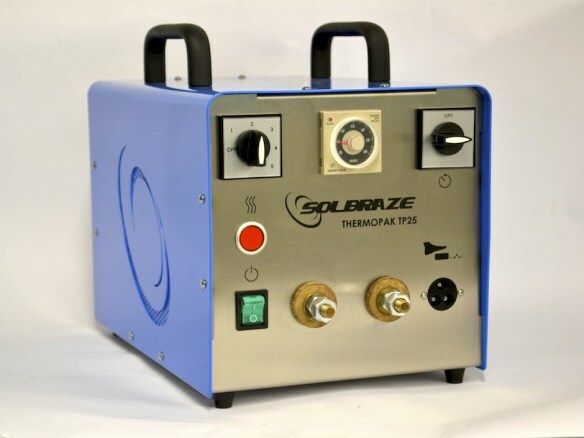 The 1.5kVA rated TP25 Thermopak is a medium power supply unit which, when used with handheld resistance soldering Thermotools such as the TT7, R7107 or a bench mounted resistance head, supplies all the power needed to rapidly heat the parent metals being soldered or brazed. The TP25 Thermopak power supply has a heavy duty voltage step-down transformer which converts the mains supply to a very low voltage, typically 3-6V on the TP25 Thermopak, but with a secondary capable of carrying the high current needed for resistance soldering. This low voltage means that the unit is safe to be used even in damp environments. Please see our resistance soldering and brazing page for more information on resistance brazing and soldering or download our resistance soldering and brazing PDF. The 1.5 kVA TP25 Thermopak has a multi-tapped primary supplying a range of 5 levels of power which are selected with a rotary switch located on the front panel. This power range helps to ensure that the correct level of heating is available depending on the application. A process timer is fitted, as standard, to control the time on repeatable jobs, settable from 0-60 seconds. The supplied footswitch provided can be used to start the timer or, when timer off mode is selected, the footswitch will start and stop the heating only when required, giving you complete control over the soldering or brazing process. A second transformer, within the power supply unit, supplies the control circuit (switches, indicator lights etc.) with a 24V supply ensuring that the equipment is safe for the operator to use. In an additional safety feature an earthed screen is between the primary and secondary windings of the heavy duty transformer so there is no danger of mains voltage appearing on the output terminals. The unit comes complete with a 12 months warranty.